Copper Nickel 70/30 Blind Flanges Dealer in Africa, Cu-Ni 70/30 Slip on Flanges Supplier in Tanzania, UNS C71500 Cupro Nickel Forged Flanges Exporter in Egypt. Sangeeta Metal is one of the leading Manufacturer, Supplier and Exporter of Cu-Ni 70 / 30 (C71500) Flanges that are actually manufactured from High Quality of Standard Raw Materials and are designed as per with national and international standards. The addition of nickel to copper improves strength and corrosion resistance in Copper-Nickel 70 / 30 Flanges while allowing the alloy to remain ductile. Other elements can be added to these Cu-Ni 70 / 30 Flanges for to increase strength, corrosion resistance, hardening, weldability and castability. We offer these Copper Nickel products in custom-made shapes and sizes as per the requirements given by our clients, and that too at an affordable and market leading prices. 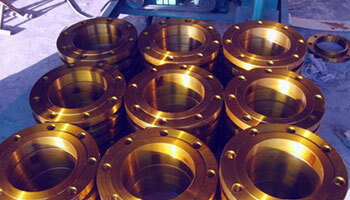 Meanwhile, these Cupronickel 70 / 30 Flanges are also at times referred as UNS C71500 Flanges.